It was extremely important to us that the voice be as human as possible, and at broadcast level in terms of quality. Amazon Polly’s voice was the most human one we found, and we felt that it was one listeners would find acceptable on the radio. FM Wakayama is the nonprofit organization that produces the Banana FM community broadcast for an audience of about 500,000 in and around Wakayama City, Japan. Unlike most regional community broadcasters, which operate as “third sector” enterprises with the support of local businesses and public entities, FM Wakayama is funded entirely by sponsors. “Without our sponsors, we couldn’t stay on the air, so we pay close attention to program quality and listener satisfaction. We aim to provide high-quality information rooted in the region while keeping costs as low as possible,” says Seiji Yamaguchi, cross-media station director of FM Wakayama. Since July 2017, FM Wakayama has also been broadcasting news and weather forecasts through Nanako, an artificial-intelligence (AI) announcer that uses Amazon Polly. 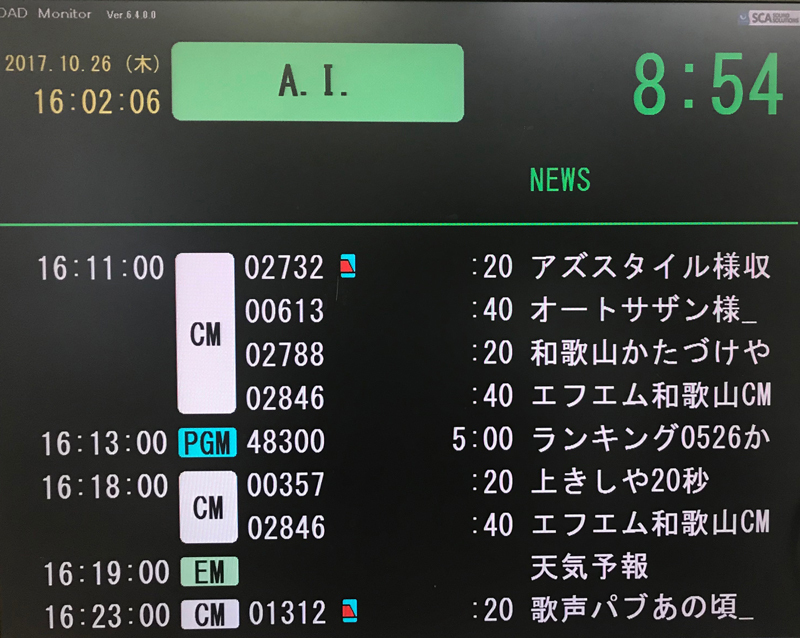 By linking Amazon Polly to its systems—which include Ontime Player, a web-based system that begins broadcasts at the correct time, and Da Capo, which can replay emergency information 24 hours a day—FM Wakayama has used AI automation to achieve stable broadcast quality even at times of day when on-air talent and directors are scarce. The voice of Da Capo, which uses Amazon Polly to broadcast emergency information. 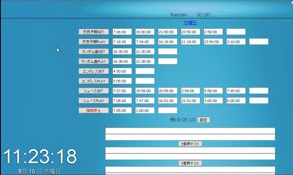 To ensure FM Wakayama’s lean staff can exercise their abilities to the fullest, the organization actively pursues innovative IT-based solutions, and has even developed its own software systems for tasks like program editing and administration. “We want to keep using IT as much as possible, to maximize the efficiency of our broadcasting. We also have a policy of using cloud solutions to improve our ability to respond in times of disaster,” says Yamaguchi. Disaster can strike at any time. Keeping announcers and other staff permanently on call in case of emergency would be difficult for FM Wakayama. And yet, in times of disaster, its audience expects regular news updates and weather forecasts around the clock, including holidays and times when the station’s staff is commuting. To resolve this challenge, the station came up with the idea of using an AI-based announcer. This would allow the station to convey vital information to the largest audience possible in a timely manner. When FM Wakayama originally explored software options for automatically reading news aloud, the costs were prohibitively high. More recently, the emergence of the cloud has led to the availability of inexpensive, highly functional text-to-speech services, inspiring the station to investigate the possibilities once more. After comparing several services, it settled on Amazon Polly from Amazon Web Services (AWS). None of the services that FM Wayakama evaluated produced speech that was entirely error-free, but Amazon Polly stood out for the quality of its Text-to-Speech voice output. "It was extremely important to us that the voice be as human as possible, and at broadcast level in terms of quality. Amazon Polly’s voice was the most human one we found, and we felt it was one listeners would find acceptable on the radio,” says Yamaguchi. Another reason for choosing Amazon Polly was its rapid response speed. Even at its slowest, Amazon Polly responds within two seconds. This means data can be loaded directly from it for broadcast, rather than uploading data to the cloud and then downloading the results in advance. This, FM Wakayama determined, would let the station modify data on the fly for real-time broadcast, instead of simply playing recordings. The volume of reference material available to developers, from enterprise user support to personal blogs, was also key to FM Wakayama’s decision. “It’s easy to find information from existing users of Amazon Polly about their own experiments and successes, which is extremely helpful. There’s also a strong user community on AWS itself, which is reassuring on the development side,” says Yamaguchi. FM Wakayama began development of its Amazon Polly–based AI announcer in mid-April 2017. The project was completed quickly, taking about one month. Trial broadcasts started in June 2017, and Nanako came into service in July. Today, Nanako not only reads the news in Japanese, but translated content is also broadcast in English. Nanako soon had a chance to prove her effectiveness during a disaster. In September 2017, Typhoon 18 hit Wakayama with devastating force, leaving up to 4,400 households without power. Nanako continued to provide weather and disaster information throughout the entire five hours of the typhoon’s passage. Nor was this a simple repeated recording. 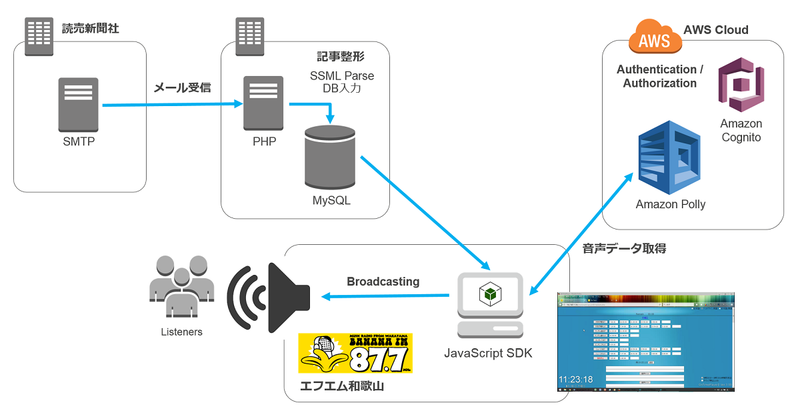 The script was updated as FM Wakayama received new information, and Amazon Polly was used to ensure the latest version was always aired. Among all the television and radio stations, only FM Wakayama and Nanako was able to broadcast continually and provide updated information. With the successful debut of the Amazon Polly–enabled AI announcer Nanako, FM Wakayama no longer needs to have on-air staff on call as typhoons approach. Using Nanako has become the baseline for times of disaster, and the station has come to view Nanako as the first choice to provide public service announcements for sudden, major emergencies. Over time, Nanako has gain widespread support among FM Wakayama’s listeners, who consider her one of the station’s major on-air personalities. “We’re already able to broadcast the latest news even in the middle of the night, and keep up as circumstances change during disasters. Nanako has made possible the kind of broadcasting we couldn’t do with humans alone. In that light, I think it’s fair to say that Amazon Polly has reinvented radio,” says Yamaguchi. Learn more about API-driven machine-learning services on AWS and Amazon Polly.